"The kookiest game of 2003 has finally been caught on the PlayStation... Ape Escape 2!" 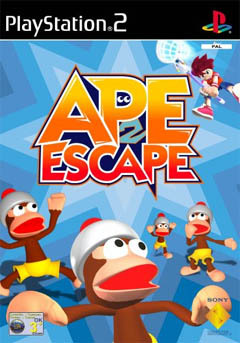 Ape Escape was originally a PSOne game that was highly popular in just about every country in the world except the United States for some reason. The premise of this arcade game was simple, you had to run around and collect monkeys. It was beauty at its most simplistic form. Ape Escape 2 is the sequel to the series and has now been upgraded to the world of 128 bit gaming with improved graphics, gameplay and a storyline that is straight out of a Japanese game show. The strange thing about Ape Escape 2 is the lack of real apes in the game as 90% of the creatures in the game are in actual fact monkeys and not apes. Fun fact #1 "Apes don't have tails"
The humour of the game, besides the title is spread out through the entire game and some of the names of the monkeys are extremely amusing. Fun fact #2 "Tomkey Cruise had me in stitches for ages"
The story revolves around Hikaru, a boy who has made a total mess of Monkey Park by accidentally releasing the Professors experimental devices throughout the theme park. The monkeys have used these experimental devices to become more intelligent, cheeky and down right naughty. Unfortunately for you, the leader of the monkeys called Specter has decided to use these monkeys and has declared war on the human race. Hikaru's job is simple, you must now travel around the entire theme park and collect these monkeys with any means possible before the professor discovers that his beloved Monkey Park has been overrun with cheeky monkeys. Ape Escape 2 is like all traditional 3D arcade platformers where you must jump, run, hit and collect various items that are scattered throughout the gaming environment. Fortunately for you, you have a variety of different tools or "gotcha gadgets" that are at your disposal to catch these naught monkeys. These tools include a bat (to stun the monkeys), a net (to catch the monkeys), a monkey radar (to locate the monkeys) and various other items that are found later on during the game such as banarangs (to attack enemies) and the dash ring that allows you to run at super speeds. As with all good arcade games, these items cannot just be used anywhere as you must work out puzzles and decipher what items you must use in order to successfully collect the monkeys. For instance, the dash ring can be used for running up slippery surfaces or for knocking down your enemies. Fun Fact #3 "Monkey's love bananas!" While the banarang can be used to attack enemies or if you are very sneaky, it can be used as a lure because as we all know, monkey's love bananas. The first few levels of the game starts off easy as most of the monkeys are out in the open but as you progress, you must use your monkey radar to help locate monkeys. This radar also tells you specific information about the monkey you have discovered on the radar such as their name, their personality and the way you can catch them. Certain monkeys have different attributes such as speed, martial art skills or the deadly blind monkeys who have a huge arsenal of bombs that can cripple your character Hikaru. The variety of different monkeys in the game is astonishing and you will meet deadly kung fu monkeys or monkeys who can box and give Mike Tyson, I mean Monkey Tyson, a run for his money. Apart from the various monkey's in the game, you will also come up against a variety of different opponents that range from mutated creatures such as bees or deadly apes with laser guns. The developers have done an extraordinary job at keeping everything fresh and new in the game. 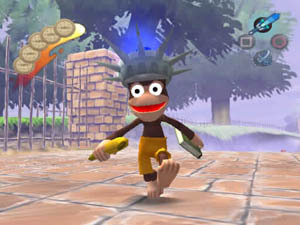 The game also contains a variety of bonus mini-games that are probably the most fun mini-games that have hit the PlayStation 2 such as monkey football or monkey climb. These mini-games are only opened when you completed certain levels or have discovered enough secrets to open up the new area. One of the most weirdest but amusing mini-games is the Monkey dancing that will have you in stitches because this is as fruity as things come on the PlayStation 2. The control system of Ape Escape 2 is a little fiddly at the best of times but that's because you must use both analog sticks. The left analog stick is used to control Hikaru, while the right analog stick is used to control your "Gotcha Gadgets", that is, if you have your club out, you must wiggle your right analog stick to perform a variety of different moves. Although an ingenious idea, it does take some time getting use to but I would of preferred that it was used to control the camera angle which you can't do in this game. In order to control the game angle, you must be facing the direction you want and push the left shoulder button to reset the camera angle. The other buttons are used to swap between "Gotcha Gadgets" but all in all, the control system comes together perfectly. Graphically, Ape Escape 2 isn't the most graphic intensive game but the plain level design and plethora of colours really suits the game. The level design is fairly sparse but there are enough enemies, buildings and trees to help keep things interesting. Some of the levels that are indoors such as the Haunted Castle are extremely impressive and the little touches such as ghosts and candles is pure eye candy. Although the characters are made up of a small polygon count, they are well animated and contain enough textures to help them pass over the line of a superior console game. There are also various special effects in the game such as lighting, water effects and explosions that give the game that extra little touch. 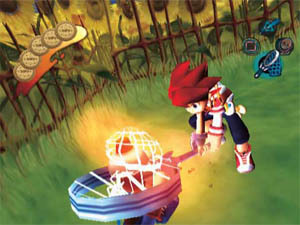 When it comes to cinemas, Ape Escape 2 uses a combination of CGI and ingame graphics to help progress the storyline. The soundtrack of Ape Escape 2 is probably the most cutest soundtrack around that is a mixture of a Japanese game show on speed meets fruity Japanese arcade game. Apart from the highly addictive theme song, Ape Escape 2 also has various other tracks throughout the game to help keep everything fresh and new. 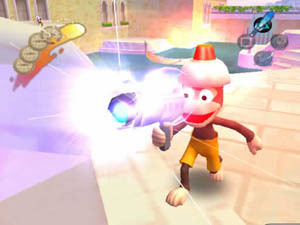 The sound effects in the game contain all the noises and sounds that you would expect monkeys to make such as screams, snarls and squeals of excitement. The voice acting of the game is a little on the rough side but it does suit the game because of the nature of it. The most unfortunate thing about the voice acting is that the characters lips are not in sync with sound but I'm guessing that is because of the conversion from Japanese to English. Fun Fact #4 "If you want a cool arcade game than buy this NOW!"